The Savonnerie manufactory was the most prestigious European manufactory of knotted-pile carpets, enjoying its greatest period ca. 1650?1685; the cachet of its name is casually applied to many knotted-pile carpets made at other centers. The manufactory had its immediate origins in a carpet manufactory established in a former soap factory (French savon) on the Quai de Chaillot downstream of Paris in 1615 by Pierre Dupont, who was returning from the Levant. Under a patent (privil?ge) of eighteen years, a monopoly was granted by Louis XIII in 1627 to Pierre Dupont and his former apprentice Simon Lourdet, makers of carpets fa?on de Turquie ("in the manner of Turkey"). Until 1768, the products of the manufactory remained exclusively the property of the Crown, and Savonnerie carpets were among the grandest of French diplomatic gifts. The carpets were made of wool with some silk in the small details, knotted using the Ghiordes knot, at about ninety knots to the square inch. 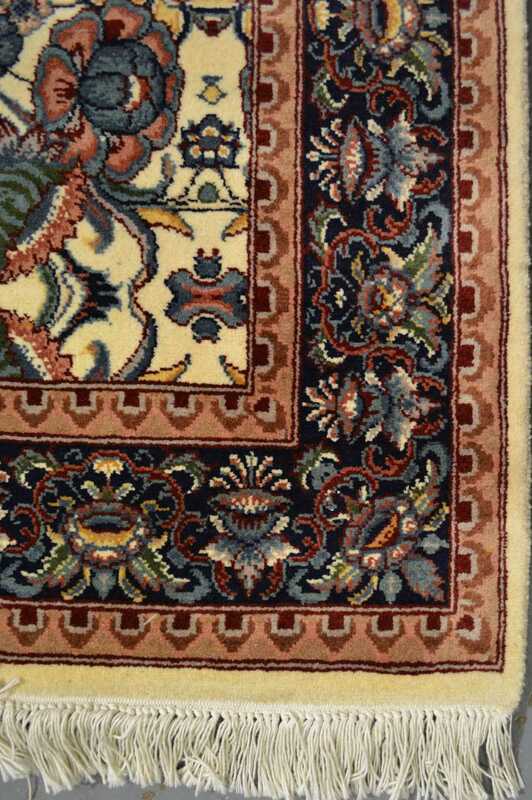 Some early carpets broadly imitate Persian models, but the Savonnerie style soon settled into more purely French designs, pictorial or armorial framed medallions, densely-massed flowers in bouquets or leafy rinceaux against deep blue, black or deep brown grounds, within multiple borders. Stringent State economics due to the financial problems arising from the wars in the latter part of Louis XIV?s reign were largely responsible for the decline of the factory between 1690 and 1712. However it was later revived and produced very pretty feminine carpets akin to the prevailing styles in the other decorative arts of the era. Soft colours, delicately drawn flowers, floral swags and ribbons are typical. But its heyday was over and by the beginning of the nineteenth century, cheaper Aubusson carpets were more popular, although Napolean employed the factory to weave handsome Empire-style carpets. In 1825 Savonnerie was amalgamated with the Gobelins tapestry factory and its independent existence came to an end.